Do You Honor or Squash Your Freedom? What does personal freedom mean to you? This Memorial Day served as a stark reminder of how servicemen and women sacrificed their lives for U.S citizens to gain and maintain our current freedom. I can walk or travel anywhere I want. I can speak whatever I want to. The press can report on daily news without getting sent to prison. This reminds me of the contrast in traveling to countries that don’t have our luxury and freedoms. I often here from clients that they want the freedom to do anything they want at any time. Yet, it takes work to get that freedom. They often forget that. Like our soldiers, it takes discipline, determination, and focus to get that freedom. It’s not just dropped in our laps. Surprisingly, I see how many of us squash our freedom and then complain about it. We are ungrateful for the precious time and resources we have. I hear – Why don’t I have enough time? I then ask, are you spending your time on activities of importance or are you just doing busywork? Do you have the discipline to get the job done swiftly without needless distractions? When you think about what freedom means to you? How determined are you to get there? Is wasting valuable time on watching TV going to get you there? Maybe you do need a relaxing moment. The question, is that a distraction or something that will get you closer to your personal freedom. Take a minute or more to honor those that have given you the freedom that you now experience. Let this be a moment to recognize how you exhibit and honor your own personal freedom. Identify where you may need more discipline, focus, and determination in your life to get to your personal freedom. 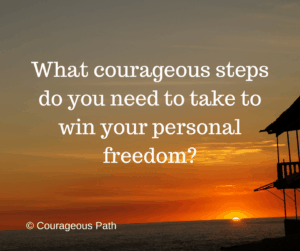 As a soldier courageously fights for our country and freedoms, what courageous steps do you need to take to win your personal freedom? A complimentary session can allow to take your personal freedom to the next level. Sign-up here. Wishing you an abundant, prosperous, and joyful day! ​​​​​​​How often do you find delight in the unexpected? Can you find excitement and joy in your day? These days were so busy running around and going from one activity to the next that we don’t stop to appreciate what’s right in front of us. When may even miss a big opportunity that’s right in front of us. ​​​​​​​In one day last weekend, I had three amazing moments of serendipity in a 24 hour period. First, I opened the door to coach a salesman on my street while I was tending to my garden. Second, I learned how to roast coffee since I was inquisitive to learn what a gentleman was doing with a cool retrostyle machine. And, third, I reached out to a gentleman working in a coffee shop to ask about his productivity journal. What does this all have in common? ​​​​​​​​​​​​​​The serendipity occurred for several reasons. First, I showed up and was curious why the salesman was not excited about his current roofing job. This lead to real authentic, heart-to-heart talk that even ended with a hug. Second, I was open to learn and be interested in understanding the procedure how to roast coffee. This in turn made the coffee roaster feel valued in sharing his expertise. And, I learned that roasting coffee is similar to popping popcorn kernels. Third, with more curiosity, I met someone who deeply shared how we lived life and want to share these experiences with others. All of these moments turned into true heart to heart connections, where we laughed and understood the other person. And, we didn’t even know each other to start. My day was brighter because I was open to these experiences and wanted to learn more. ​​​​​​​Where in your life can you be more curious, more open to another’s perspectives? Do you show up on a daily basis ready to serve the world? ​​​​​​​If an amazing opportunity was dropped in your lap, would you be able to respond appropriately? Or, would you say, I already have too much on my plate, I can’t do anything else right now. 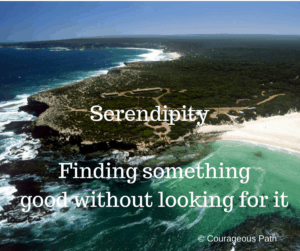 ​​​​​​​Most of all, where can you find serendipity today? ​​​​​​​Join me for a complimentary coaching session and we’ll get serendipity back into your life. Wanderer or Lost? Which Are You? What’s the difference between those who wander versus those that are lost? And, why does this apply to you? The difference is how you approach life and from what perspective. Let’s take a closer look at wander vs lost. If you’re lost, you’re probably a bit scared. You’re not sure which way to go. You fear taking a step that might go in the wrong direction. You don’t know who to ask for directions and may not even know who to ask. When you’re lost in life, it’s the same concept. You feel stuck, frustrated and a bit annoyed at the situation. Yet, you don’t know how to get out of the situation or where to turn. On the flip side, if you’re wandering through a new city you still have something in mind, even if it’s subconscious. Maybe it’s an intriguing store, or a local trendy café, or perhaps an art gallery? You have an idea of what catches your eye and what doesn’t. You know what store you’re willing to spend time in and which ones you won’t bother walking into. You have an idea of what you like but not how to get to a store that has exactly that. When you wander, you’re ready and open to explore and attempt something new. Ready to see what lies ahead. It’s all intriguing to you. You think creatively to explore new terrain or how to go about something in a different way. I remember exploring Rome, Italy by finding the 10 gelato (ice cream) stores and walking around each neighborhood. This weekend, this concept really hit me. I wanted to a hike a new trail in the mountains. After hiking about half a mile, the trail disappeared into thin air. No trace of where to go. While we had a list of directions, landmarks, and a map, something was off. We had a goal in mind to hike to a lake. We wandered in the direction of the lake, carefully assessing each turn. Sometimes we went up, sometimes we hiked down, and other times traversed the mountainside. We said, hey, let’s get to over there and see what the terrain looks like from there. We assessed our path at different points along the way. The same applies in your life. You don’t always follow the same path. Stop and evaluate what’s working and what’s not. Then make a course correction and readjust. This weekend, we adjusted every 30-45 mins. And, while we didn’t make it to the lake, we enjoyed great company, a beautiful solitude day with no one around, and got some great mountain conditioning in. And, we agreed to a turnaround time which would have applied to being on a trail or not. We had a fabulous time. Let’s apply this back to you. 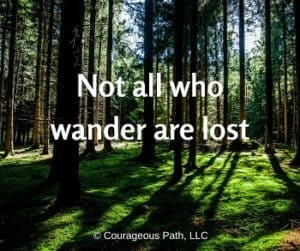 What are the areas in your life where you’re a wanderer and where are you lost? What adjustments do you need to make? Are you ready for a life course correction? Join me for a complimentary coaching session and we’ll get you back on your courageous path. Is your life garden full of flowers or weeds? How often do you take the time to weed out what no longer serves you? Let’s use the metaphor of a garden for how much we are growing in our lives. After all, if we’re not growing, we’re stagnant or stuck. And, that’s no fun. For our garden to grow, we must water and provide nutrients to our plants. The same applies to our life. How are we feeding our minds and bodies? The ironic part is – the more water and nutrients we give to the gardens of our lives the more weeds pop up, too. Frustrating, right? Let’s take a step back. We think that if we give our gardens and lives all the water and nutrients, we’ll be just fine. However, that’s not the case. If we’re not careful, the weeds which also take up the water and nutrients can grow faster and strangle out our intended growth. So, what are the weeds in your life? The weeds are people, situations, or habits that no longer serve you. Do you have someone in your life that really bring you down? Do you have a situation that’s gone on way too long that hasn’t been handled? Do you have bad habits that undermine your path forward? This can be as simple as going to bed earlier so you’re refreshed when you wake-up. When we work really hard, give our life and soul to something, it’s difficult to let go. Yet by going through this process, we open up and create more space for what we really want. Take a minute and think about it. 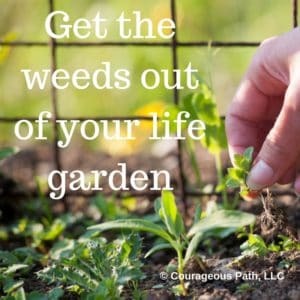 What do you need to weed out of your life? Join me for a complimentary coaching session and we’ll identify what weeds to get rid of so you can grow and flourish. Do You Walk Past Dog Poop Daily? Ever almost step in dog poop that wasn’t picked up? I had this exact moment last week while on a run along the river in Austin. I came within inches of stepping in dog poop. So, how does this relate to you? How often do we leave our s**t for others to handle and deal with? Think about it. Do you bring home a bad day of work and then your spouse and kids have to handle your bad day? You bring home a bad attitude and then let it affect every interaction for the rest of your evening. Or vice versa, you had an argument with a family member and then this permeates your attitude when you go to work. You’re short with a colleague for no reason at all. Perhaps you raise your voice when someone disagrees with your idea at a meeting. Does this ring a bell? We’ve all been there at some time or another. What’s the missing piece? Intention. We run with the motions so much that we don’t change our intention from situation to another or when we change the people we are with. Ask yourself, what is your intention going into this meeting? How can you serve them? What outcome do you want to have? How can I raise the energy level of the people I’m with? Here’s how this works: When you transition from work to home. Before you get out of your car or enter the door to your home. Take a deep breathe. Say to yourself, once I walk through this door, I leave behind my work day, and will greet my loved ones with warmth and acknowledge their presence and honor them. Does that sound different than how you work now? Let me know how this works for you.